With only ten days to go before Scotland decides on its future as either an independent state or part of a "family of nations", the UK's party leaders dropped into Scotland in attempt to boost the No vote. Prime Minister David Cameron as well as Labour leader Ed Miliband abandoned their weekly prime minister's questions clash to fly north. Deputy Prime Minister Nick Clegg also followed prompting First Minister Alex Salmond to call them the "Three Amigos". In what appeared to be a last ditch attempt to turn things around, the Westminster troop needed to seize the initiative and persuade the Yes camp that Scottish independence would not be good either for Scotland or the UK as a whole. Amongst the nationalist camp there is a rejection of assertions that Scotland would be unable to go it alone. Indeed many appear to be ignoring or glossing over fundamental issues. Salmond self has evaded questions or given woolly answers concerning issues such as the future of the Scottish currency, defence, NATO membership and even border controls. Writing in The Times, Sir John Major said the repercussion of Scottish independence would be profound. "I believe Scotland and the whole of the UK as a whole would be damaged." "The UK would be weaker in every international body and, most damagingly, within the European Union. Our chance of reforming the EU would be diminished, and the risk of our exit from it enhanced." Scotland too would face major challenges. As Salmond maintains, Scotland would be able to become a part of the EU. However, the current policy of the European Commission, as set out by its last president, José Manuel Durão Barroso, is that an independent Scotland would have to apply to join the EU. The Scottish government disagrees since it believes its membership would be continuous. It denies Scotland would be forced, as new nations are, to join the euro. The current consensus among EU member states is that Barroso is correct in his assertion, but it remains to be seen. Scotland's independence would result in it no longer being a part of NATO. Whilst it could apply to join NATO, it would need to commit to spending 2% of its GDP annually on defence, reversing the defence cut it has promised to make after independence. England would also face dilemmas concerning its significant military presence in Scotland. There are a number of submarine, navy and other military bases which may well be forced to head south, at great cost to the rest of the Union. Currency is one of the much discussed issues. Salmond maintains that Scotland will continue to use the pound, though Westminster says he can't. 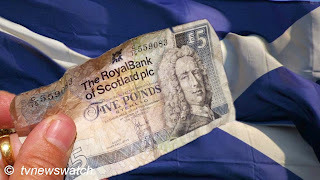 To allow the Scots to use the English currency without the Treasury in Whitehall having control of Scottish economic policy would incur massive potential liabilities for the English taxpayer if the Scottish economy imploded. Of course Scotland could choose to use the pound, in the same way that some Caribbean islands use the US dollar despite being outside America. However, divergence between the two economies could make Scotland a debt-ridden state much as Greece is to Germany. Choosing to use the euro in the same way would bring similar problems. Furthermore Scotland cannot adopt it officially while it is still outside the EU which brings up the issue concerning membership which is again tenuous. Scotland could set up its own currency, but it might face rapid and possibly steep devaluation, especially if it defaulted on its historic share of UK debt. Scotland has 8.4% of the UK population, and could be expected to pay 8.4% of the national public debt amounting to £111 billion of the current £1.32 trillion debt. However, the SNP say they won't honour the debt unless England agrees to a currency union, which itself is highly unlikely. No-one has yet proposed rebuilding Hadrian's Wall, but there have been some serious discussions concerning border controls. Should Scotland join the EU, it would be forced to join up to Europe's Schengen agreement, which effectively abolishes internal borders. This would mean that anyone on the Continent could travel to Scotland unhindered. Such concerns have prompted the likes of Ed Miliband and others to intimate that a Yes referendum result could lead to policed border controls and passport checks between England and Scotland. Indeed Scottish citizenship would require the issuing of Scottish passports. And then England and the rest of the UK could bar Scottish citizens from England, Wales and Northern Ireland until such times as Scotland's membership of the EU is ratified. These aren't the only challenges facing an independent Scotland. There are of course worries about the economy itself and how an independent Scotland will make money. There are debates over its future head of state. The Queen would likely stay as the Queen of Scotland, though Scots could invite the man regarded by some as James's legitimate heir, the 'Stuart Pretender', to replace the her. That would mean the present Duke of Bavaria becoming King Francis II of Scotland. However, Duke Franz claims to be perfectly content where he is. Less of an issue for Scotland is what might become of the Union Flag. There has been much debate over this. Some have suggested that the flag might remain as it is, though a redesign is just as likely. The blue background might well be erased or even replaced with another colour [BBC]. Nothing is certain other than the debate over Scotland's future will continue well after the vote on September 18th.